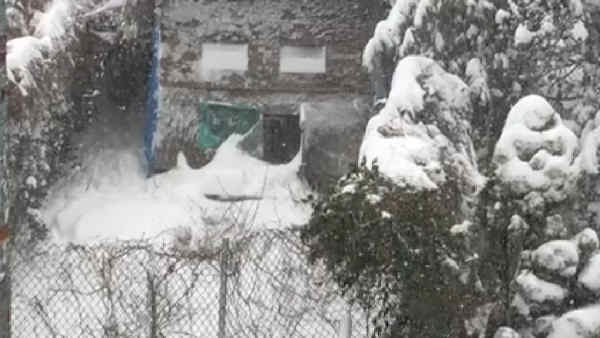 BROOKLYN (WABC) -- A Brooklyn woman was issued a summons after she left her two dogs out in the blizzard, and a neighbor recorded the wailing pets and posted it on her Facebook page while pleading for help. The incident happened on President Street, where the two pit bulls were left out in a small enclosure in the yard of the building. Evelyn Tully Costa posted the video, on which Becky Susan Perkins-Peacock commented "2 short-haired pitbulls have been left outside all night crying and whimpering (on) President St. Between Franklin and Bedford Avenues in Brooklyn Ny. Authorities have been called numerous times. No one cares! What will it take to help them.? They are old dogs!! I it is 3pm and they're still out there crying!! Please repost!!" The post was shared more than 5,000 times. The NYPD responded, issued a summons and told the woman to bring the animals inside. "In New York City situations do arise where an animal's living conditions may not be ideal, but do not meet the definition of animal cruelty as defined by the law, making seizure by the police impossible. In these cases, the ASPCA attempts to work with pet owners through our Cruelty Intervention Advocacy (CIA) Program to educate the owner and improve overall conditions for the animal. We are currently collaborating with several groups to improve conditions for the dogs, and to continue to follow-up with the pet owner to ensure the health and safety of the animals. The ASPCA fully supports strengthening existing sheltering laws to further protect animals kept outside, and we strongly encourage pet owners to bring their animals inside during colder and warmer months."